Do you have big plans for exciting travel this winter? 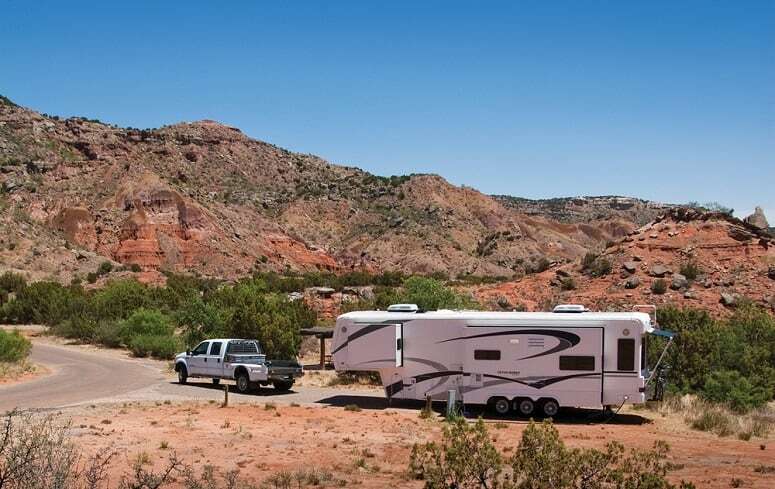 If you’re planning on hitting the road in an RV or camper, there are some great stops you should add to your list—maybe even a few you haven’t yet considered. If you haven’t thought about a trip during the colder months, maybe you should. Don’t think of winter as an endless stretch of time while you wait for “the good weather” to get back on the road. Whether you’re looking to escape the cold, or want to embrace the beauty of winter, these fun, breathtaking sites are worth a visit. Winter is the perfect time to visit Utah. The off season brings fewer crowds, lower prices, and gorgeous landscapes. If your camper it outfitted for full-time winter living, you’ll have everything you need to pull off a winter at Zion National Park. Zion National Park has beautiful canyons, hiking trails, and observation points. 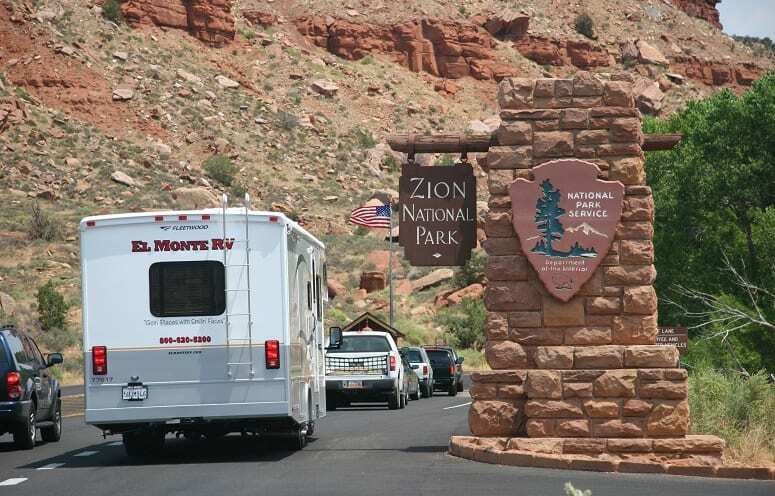 During the peak of the season, you’ll need to hop on a shuttle with other visitors for the scenic 6.5 mile drive along Zion’s largest canyon. However, from November through March, you’re free to take your own vehicle. Visiting during the off season will have some disadvantages, however. Seasonal businesses may not be open and those that are may close at an earlier hour. You’ll enjoy the fact that Zion National Park has about 200,000 visitors during January and February—instead of the usual 1 million plus it experiences in June and July. The wildlife in winter is beautiful and abundant, with opportunities to see both bald and golden eagles. If you’re into animal watching, it will excite you to know that Zion boasts 78 species of mammals and nearly 300 species of birds—not to mention the numerous fish and amphibians you can come across as well. You’ll want to plan your activities in accordance with the weather, of course. When the weather is good, hit those higher elevations for scenic drives and beautiful hiking. Wear layers and you’ll be ready for whatever weather you encounter. If you’re hit with a bad day, you can enjoy the beautiful landscape from inside your camper or venture into town. It’s tempting to visit Sedona in the spring and fall, with its temperate climate and outdoor recreation opportunities. There’s no bad time to visit, though, and there are some serious perks to planning a winter stop. Even during the coldest months of the year, daily temperatures hover around the 50s. Many locals, however, frequently make their way further south for warmer weather. You’ll find that hotel rooms are readily available and offered at great prices. It doesn’t get any better than that if you’re traveling in a camper that doesn’t winter. You may occasionally see a dusting of snow during the winter months, but you’ll mostly see the rich reds that Sedona is known for. Trails remain open for hiking and provide exceptional views of gorgeous Sedona. 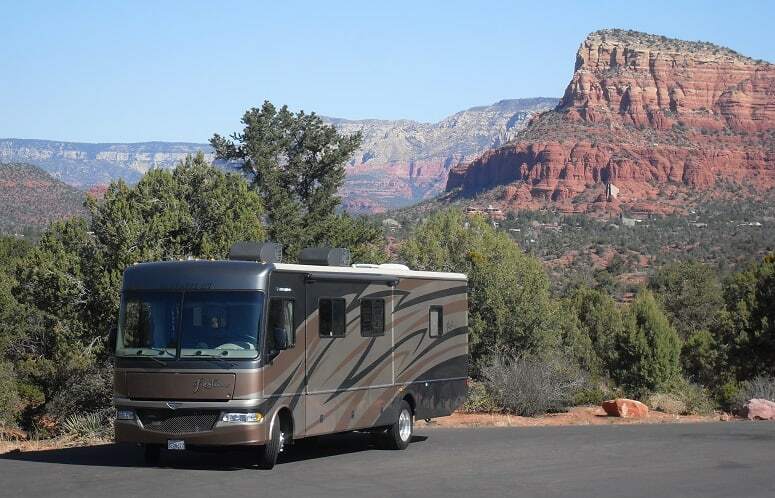 If you’re looking to visit Sedona on a budget, nearby campsites can cost as little as 20 dollars a day. Coconino National Forest is nearby, and Sedona is full of fun and eclectic shops. Whether you’re interested in the jeep tours, hiking, or dining, Sedona has a little bit of everything for everyone. This part of Arizona is known for both its artisans and its beautiful southwestern fine arts. Even on the days you aren’t enjoying the rugged outdoors, you’ll be captivated by art. Nestled between historic mining towns and beautiful forests, you won’t be disappointed with a trip to Sedona this winter. It’s just as magical during the colder months as it is during the warmer ones. The Grand Canyon is a breathtaking natural wonder. If you haven’t carved out a visit before now, this winter may be the perfect time. If you hit the Grand Canyon during July, the peak visitation month, you’re looking at daily temperatures that can soar over 100 degrees. Stop by during the off season in February and, depending on your location in the canyon, you’ll be looking at comfortable 50s-60s weather, with lows still well above freezing. Besides the comfortable temperatures, you’ll get to enjoy the incredible scenery and outdoor experience without the crowds. You’ll also have access to off season rates, which means your dollar will go further when it comes to campsites and entertainment. The lack of visitors and the temperate climate is a plus for anyone interested in seeing wildlife in its natural habitat. Many species in the Grand Canyon National Park—like the California condor—are protected and endangered. You may not have the opportunity to view them elsewhere. While the road to the North Rim of the canyon is closed during the winter, you’ll be able to see it from other parts of the canyon. The canyon is only ten miles across—as the bird flies. That short distance is misleading though, as it’s an incredible 220 miles by car to make your way from one end to the other. Plateau Point offers incredible scenic views. If you’re hiking during the winter, though, you do need to be prepared for icy trails. Dress in many layers, with material that can withstand icy winds, and you’ll be ready for one epic experience. Not everyone needs to pursue snow and cooler temperatures during the winter months. If the southwest doesn’t suit you, you may find heading south does. You don’t need to make it all the way to Florida to reap the benefits of the trip. If you haven’t been to Myrtle Beach in South Carolina before, it’s a resort area nestled among 60 miles of beaches along the Atlantic Ocean coast. It’s well known for its boardwalk, amusement parks, arcades, and golf courses. Myrtle Beach is temperate enough year round that many attractions remain open. While you may not want to sunbathe in the 60 degree weather, the beach is still great for walks, bike rides, and relaxing in the sand. Since it’s a tourist destination, during the off season, shopping and dining crowds are minimal. Discounts and deals on vacation fun are plentiful. If you’re feeling adventurous, ziplining and the famous Myrtle Beach Skywheel might appeal to you. The nearby Children’s museum offers the perfect activity for a change of pace from salt and surf. Stop by the Myrtle Beach State Park while you’re out there. 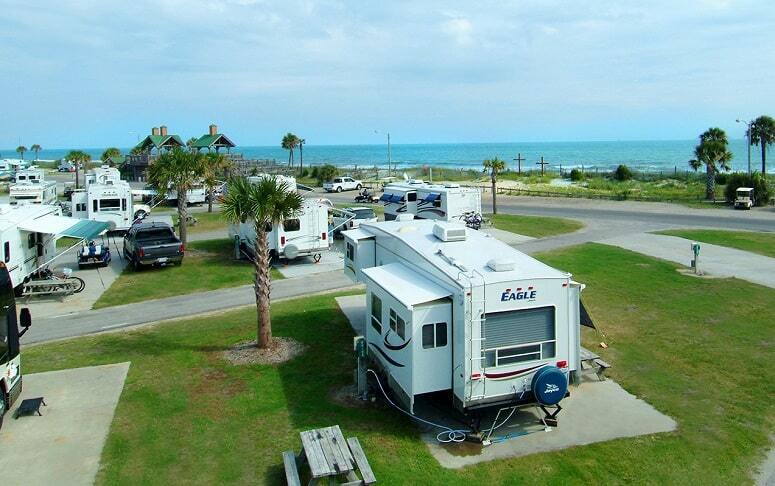 With nearly 300 campsites, you can even make it your home base during your trip to South Carolina. New Orleans, Louisiana, boasts an incredible amount of history. The architecture alone is worth making a visit for. It’s not just the man-made features that make New Orleans attractive either. If you have a deep-rooted love for nature—including forests, bayous, rivers, and wildlife—prepare yourself for a love affair with Louisiana. If you’re stopping by the French Quarter, make sure you have your reservations in place ahead of time. The food is unparalleled. Forget prepping your own meals while you’re visiting—plan on indulging in the unique cuisine that’s become a hallmark of the city. This is one time when you don’t want to rely on your GPS system to get you to and from locations. 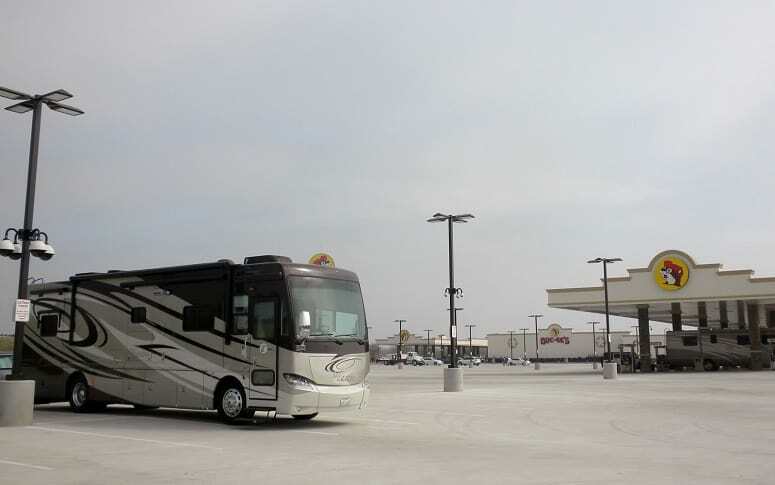 Navigating New Orleans is complicated enough—and that doesn’t account for the additional issues you can expect to run into with your camper. New Orleans offers the perfect mixture of cultural explosion and experience with the gorgeous backdrop Louisiana has to offer. If you love music and the history of its evolution, there’s no better place to be than New Orleans. Jazz performances, artists, and festivals are all worth looking into. Don’t let the cultural experience end there, though. Make your way to Jackson Square for sketch artists and fortune tellers, as well as traveling performers. Experience the authenticity that New Orleans has to share. You’ll take a little bit of it with you when you go. Traveling to Florida over the winter is a classic American pastime—and for good reason. There’s no better way to shake off the winter blues than to head south for some fun in the sun and surf. 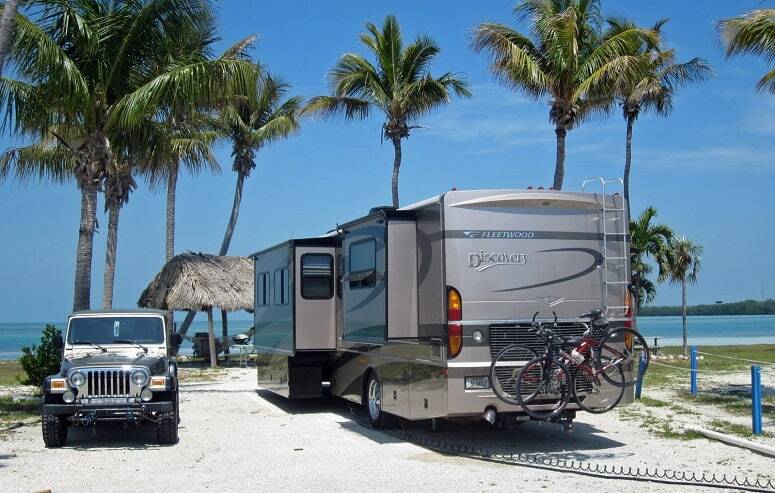 The Keys are the perfect getaway for a winter trip to Florida. An average temperature in the 70s even through January, the Keys offers comfortable weather, plenty of outdoor activities, and a gorgeous landscape. There’s not much here to even consider as a drawback. The only thing you will need to factor in is that you aren’t the only one who has this brilliant trip in mind. Unlike other locales where this is an “off season” market, Florida is very much in season during the winter. If you have the time, consider renting for a full month instead of by the day. Even if you don’t stay the entire time, you may find it will cost you less and provide you with more flexibility for your trip. Whether you’re looking to fish, eat, or just close your eyes and absorb the sunshine, the Florida Keys is the place to do it. 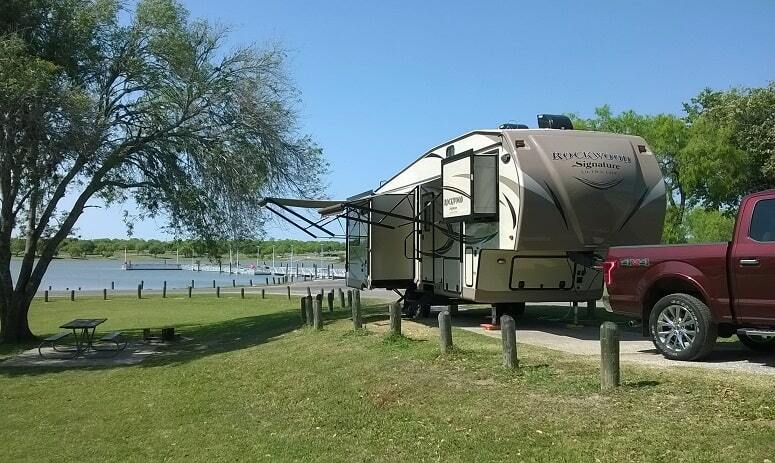 Snorkeling opportunities are amazing, and RV sites right on the water make for incredible morning views over coffee. Visiting California during the cold months is another logical choice. Whether you’re in the mood for breathtaking forests, mountains, or incredible coastlines, California offers it all. The small city of Buellton, California is located in Santa Barbara county of the Santa Ynez Valley. With a population of just over 5,000 and near junctures with Route 101 and State Route 246, it’s convenient to get to. More than just convenient, though, Buellton is an incredible destination in its own right. The Flying Flags RV Resort, located right in Buellton features a firepit and gorgeous views of vineyards. The landscape is lush, the weather beautiful, and the amenities are fantastic. Should you find that you need a break from the greenery, you can simply make your way to the wharf. Whether you’re there to see the fishermen in action or to spend some quality time bird watching, you’ll be in for a treat. If you haven’t been to the Santa Ynez Valley, you don’t know what you’re missing. Everyone knows great wine comes from Napa and Sonoma Valley, but the truth is, there’s amazing wine coming out of the Santa Ynez Valley as well. Maybe you’ve been thinking about hitting some of the major tourist spots in California this winter. If you’re looking for something quiet and relaxing at a leisurely pace, though, don’t forget to consider Buellton a true contender. If you haven’t spent much time in Texas you may have a pretty good idea of what you think it looks like there. You might be surprised to learn Texas offers some serious landscape variety. It is, after all, the second largest state the United States has to offer—surpassed only by Alaska. Located in Southern Texas on the Gulf of Mexico, Corpus Christi is a bird watcher’s dream destination. With miles of coastline on the undisturbed Padre Island National Seashore, the species of birds and opportunities to witness them in their natural habitat are endless. If the Padre Island National Seashore doesn’t satisfy your craving, you can also take a hike along the Great Texas Coastal Birding Trail. The marine life is equally stunning. Whether you’re seeing it in the Gulf or hitting up the Texas State Aquarium, you’ll be amazed. Corpus Christi offers family fun, historical sites, and a great escape from the harsh winter weather up North. Plan your trip today and you can be in paradise by the time the chill sets in. If natural beauty speaks to you, you won’t want to miss out on visiting White Sands, New Mexico. White Sands is a great escape from cold weather that won’t draw the masses and crowds that touristy areas do. Known as the “Sea of Sand,” White Sands is a large expanse of white sand. With an incredible blue skyline and the dunes in the distance, this is the kind of trip that can reinvigorate and rejuvenate. 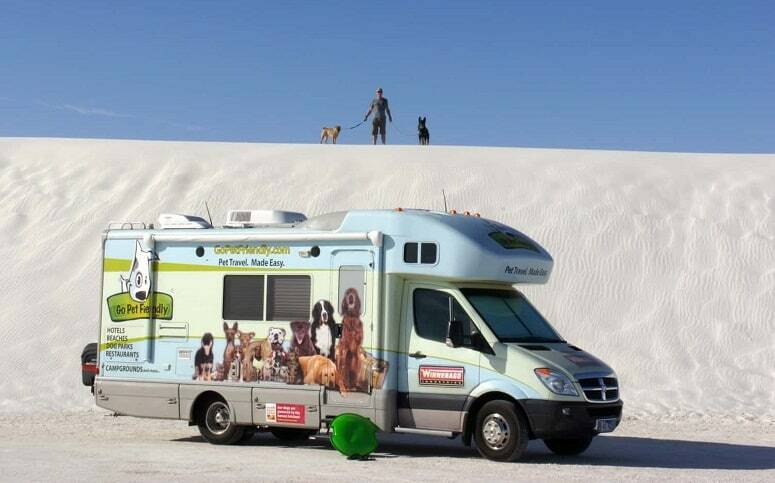 Located in the Tularosa Basin, the White Sands National Monument is a part of the national park system. With 275 square miles of untouched land, it’s a snapshot of New Mexico’s history and a reminder of the beauty we have right here in our own backyard. While there, take the Dune’s Drive, a 16-mile ride that will bring you into the center of the dunes and allow you to pick up trailheads. Make sure to give yourself plenty of time here—you’ll be surprised at how long you’ll want to linger to enjoy the beauty and stop for photos. New Mexico can be easy to overlook or to consider a state you drive through on your way to your ultimate destination. Plan a trip today to see what you’ve been missing. If you’re looking to embrace winter, rather than escape it, consider a trip to Estes Park Colorado. No place does winter as well as Colorado. If you love snow and beautiful backdrops, you simply can’t go wrong with a trip that makes this a destination. Well known for the skiing opportunities, incredible scenery, and perfect snowfalls, Colorado has long been a winter destination for those who just can’t get enough of winter. If you’re one of those die-hards who can’t give up the perks of winter, plan to stop by Estes Park. 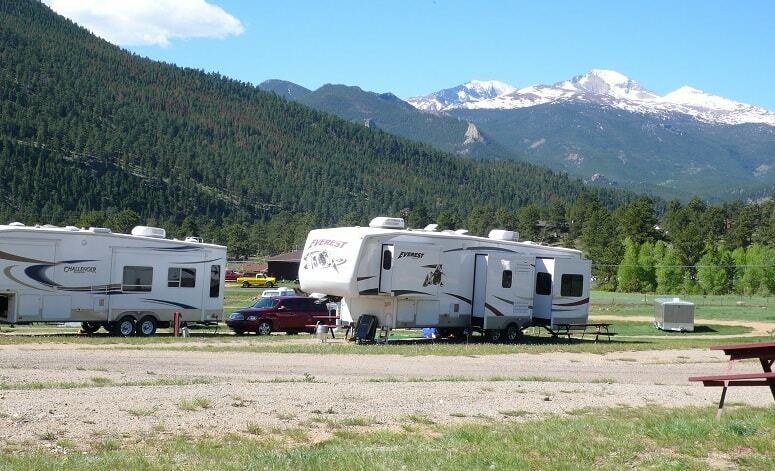 Located between Jellystone National Park and Rocky Mountain National Park, you’ll be able to reap the benefits of both locations. You’ll also be within short driving distances to some of the best skiing the country has to offer. Whether you’re in it for the thrill of downhill skiing—or would rather watch others from a cozy firelit lobby with a warm cup of coffee—Colorado will always deliver. If you plan on making this one of your winter destinations, make your reservations early. Colorado’s peak season is during the winter months and places fill up quickly. Did one of these destinations grab your interest? Are you already squaring away the details and planning a winter trip that you and your loved ones won’t forget? We know you won’t be disappointed with any of these 10 beautiful camper destinations. If you’ve made one of these trips before, or have another superb winter destination we didn’t cover here, we’d love to hear about it. Maybe it’s one we need to plan for our upcoming winter. Add a note in the comments section below and share your experience.